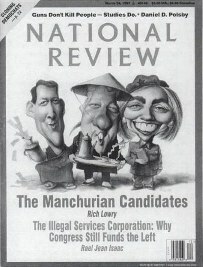 On 24 March 1997, The National Review published an illustrated cover of then President Bill Clinton, Hillary Clinton and Vice President Al Gore. They were in stereotypical Oriental garb and featuring caricatured features, buck teeth and slanted eyes. Asian Americans across the country were incensed. Daphne Kwok, executive director of the Organization of Chinese Americans described the cover as extremely offensive and racist. She complained that Asian-Americans sense that their patriotism is being besmirched. The National Review was unrepentant, editor John O’Sullivan denounced the complaints as orchestrated by the ethnic grievance industry and demanded an apology from Ms. Kwok.